Ever wonder about the place where you have lived most of your life? Places do have qualities and are we too a product of those qualities? Is the state of Michigan where I live also a state of mind? I didn't used to think too much about this, but I got my eyes opened a bit back in the 1980s, plus back in the 1970s I developed an astrological mapping/relocation technique called "Local Space," which is now used by astrologers all over the world. Here are three things that I have learned about Michigan (where I live in a small town called Big Rapids) that I consider interesting. 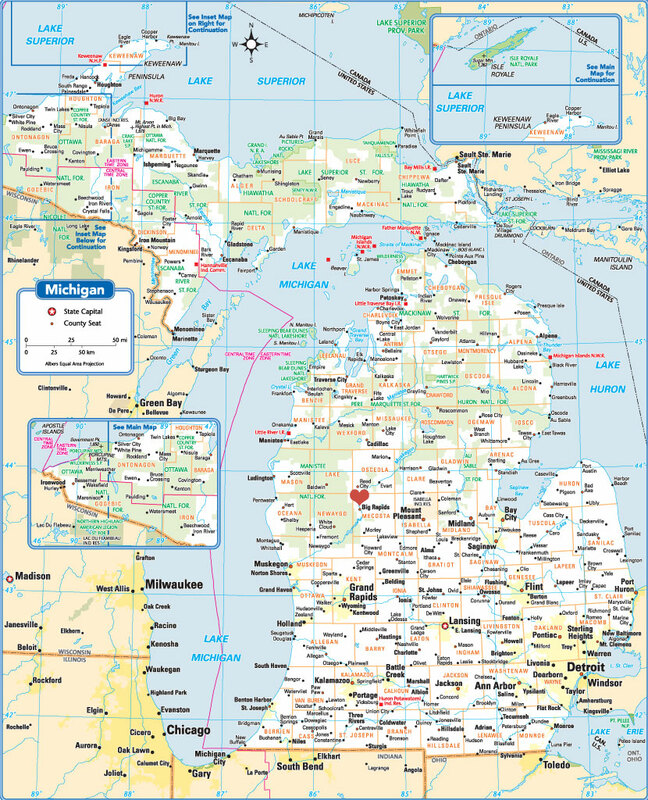 We all know that Michigan is the only state that is a peninsula surrounded by fresh water, in fact two of them, appropriately called the Upper and Lower Peninsulas. I never thought too much about the fact that Michigan is a peninsula until some years ago when I put on what I have been told is the first conference on Hindu Astrology in the United States. This was before Hindu Astrology was called Vedic astrology, as it is today. And I put on a second Hindu Astrology Conference a few years later. People came from all over to attend. In the course of putting on those conferences I invited a number of Indian astrologers, some of whom traveled all the way from India. Hosting these conferences is a story in itself, but I will tell that another time. I can, however, remember late summer nights as these Indian astrologers would stroll arm-in-arm (six persons wide) down the center of the street where I live, something I would never think to do. I was worried they would be run over by some American in a hurry. Fortunately that never happened, but I didn't want to spoil their fun. In the course of welcoming these Indian visitors, they seemed to have no idea where Michigan was, even though here they were. They asked me if I had a map and would please show them where in the world Michigan is. I soon dragged out an atlas and pointed to the state of Michigan. There it is, I said. And to my surprise, my visitors, almost every one of them, began to ooh and aah about what they saw. Now I like Michigan, but why would these perfect strangers make eyes over it? It was the shape of Michigan that caught their attention; in particular that Michigan is a peninsula. Apparently in India any peninsula is considered a sacred place because it is in the shape of a lingam or phallus, not something that Americans are (or probably want to be) aware of. They went on and on about it, and ever since that time I have been curious to see what possible benefits or consequences there might be for living in a state that has this sacred shape. If ancient India declares peninsulas sacred, what is the effect of that? They are an ancient culture, so it must be something. Of course, I have always loved that Michigan has more than 11,000 inland lakes, and this is not counting ponds, which are lakes of 25 acres or less. And forget about the fact that Michigan itself is surrounded on three sides by water, the Great Lakes. In fact, as a kid, Michigan license plates used to have blazoned across them the words "Water Wonderland." I believed it. Other states have many lakes, but none are a peninsula and closely tied to 1/5th of the world's fresh water supply. The Great Lakes (also called inland seas) are the largest-surface freshwater system on Earth. Only the polar ice caps contain more fresh water and thpse caps are now are slowly melting into salt water. Meanwhile, the Great Lakes contain 84% of North America's fresh water, not to mentioned 21% of ALL the fresh water in the entire world, enough water to cover the 48 contiguous U.S. states to a depth of almost ten feet. Lake Michigan, nearest to where I live, is almost 1000 feet deep at its greatest depth. Now that's a lot of water. And to go with that water, we have salt. Some 1200 feet beneath the city of Detroit is a vast salt dome, said to be part of the largest salt deposit in the world, some 71 trillion tons of unmined salt, the Detroit Salt Mine. The Detroit Salt Mine has over 100 miles of subterranean roads, and is an industry that predates automobiles, with a product older than the dinosaurs, some 400 million years. Many miners were killed building that 1200-foot shaft down to the deep mine and any equipment that was lowered down in the 6'x6' shaft never came back up, and this includes the mules they needed, who once down there, lived out their sad lives in its depths. What a grotesque thought. And it is not just Detroit that has salt. Geological studies estimate that beneath the 55 counties of the Lower Michigan Peninsula are over 30,000 trillion tons of salt, more than any other place in the world. The entire lower peninsula of Michigan sits on a bed of salt. Salt is not valuable today, but in the past it was as valuable as gold in China, which used salt coins for payment. Roman armies were once paid with salt, which is where the term "salary" originated. It came from the Latin word for salt, 'sal'. So there are three things about Michigan I have been pondering, the fact that it is a peninsula, is surrounded by 21% of all the fresh water in the world, and that it sits on top of the greatest deposit of salt on the planet. Maybe Michigan needs all that water to quench our salt thirst. Just the fact that Detroit sits on a vast dome of salt is enough to say that Detroit is Yang, as in Yin and Yang. Right? In fact Michigan itself has to be very Yang, because all of it sits on salt. Does this salt and all the water mean anything to those who live here, and what about this idea of peninsulas being sacred? "Inquiring Minds want to Know," as the magazine says. Does American have naturally holy places as India and other ancient countries do? America is not that old, but the land beneath our feet is as old as China and India, so what about that? I have some thoughts about this sacred peninsula we call Michigan, but I will have to share it in another post, as I can organize my thoughts. What do you Michigan friends think?